Come on Saturday and enjoy the huge Swap Meet held on the National Western Stock Show grounds – it’s free with your price of admission. 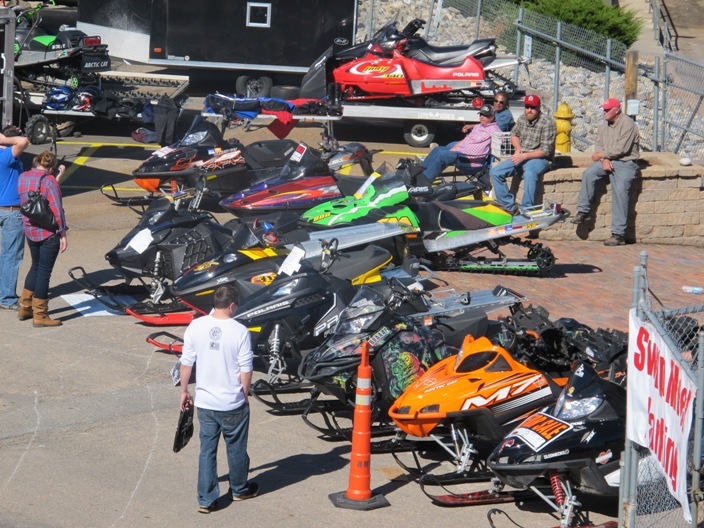 The Swap – hosted by the Colorado Snowmobile Association (CSA) and arranged by Steamboat Powersports – is a great place to shop for used sleds and equipment. It’s also a fund raising activity for the Colorado Snowmobile Association – the voice of snowmobilers in the state. CSA protects your right to ride and we appreciate your participation and funding. The entrance will be at the southwest corner of the parking lot, Gate 5 on East 46th Avenue. See details below the photos. The 2018 Swap Meet will be held Saturday, October 6 at the National Western Stock Show Complex north of the Expo Event Center at 4655 Humbolt Street, Denver, Colorado. The entrance will be at the southwest corner of the parking lot, Gate 5 on East 46th Avenue. This is fund raising activity for the Colorado Snowmobile Association. The CSA protects your right to ride and we appreciate your participation and funding. Steamboat Powersports has volunteered to run the swap meet for CSA. Please thank them for their efforts! Space sizes 1-4 are on a first-come, first-serve basis starting at 7 a.m. Saturday. Parking closes at 9 a.m. Please send registration and payment in advance. Space #5 (large spaces): Must be before 8:30a.m. Saturday. Friday evening parking available by contacting Jim Panozzo at Steamboat Powersports at 970-879-5138 or 815-405-8932 (cell), or by email at info@steamboatpowersports.com or jimpanozzo@steamboatpowersports.com. Departure begins at 6 p.m. If you have the #5 space you can park overnight until Sunday afternoon for your convenience, though its possible some trailers may need to be shifted within the area depending on other events occurring at the facility, and no onsite overnight security is provided Saturday night. No businesses will be allowed to display or sell in the swap area unless they have purchased space on the main show floor. The CSA will provide two outdoor restroom facilities. No new merchandise is allowed, used items only. Trash: No trace procedure — please pack out what you pack in. Do not transport sleds with engine running. Sled dollies will be available. No trucks attached to trailers. However, parking is available close by. please download the CSA Swap Meet Registration Form [PDF].